Every Wednesday of SOLIDWORKS World they show the top ten enhancement requests for their next design cycle. Enhancement requests are submitted by users (through the customer portal or via other means) and are an important tool used to determine the direction of future releases. 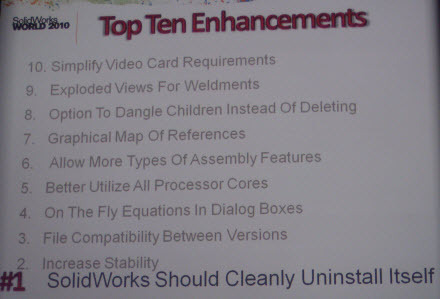 SOLIDWORKS announced that over the last ten years, 70% of all top ten enhancements read at SOLIDWORKS World have made it into the released version of SolidWorks.